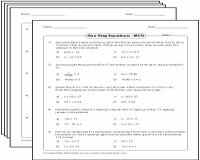 These printable one-step equation worksheets involve the multiplication and division operation to solve them. 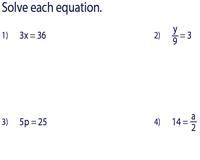 Given below are separate exercises for equations which involve integers, fractions and decimals coefficients. 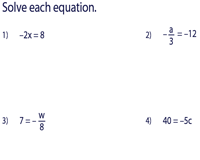 Solve the one-step equations by performing multiplication and division operation. 'Level 1' has simple equations for the beginners. In 'Level 2' the complexity of the problems increases. Solve each one-step equation by multiplying and dividing them. Each worksheet has 10 problems for practice. 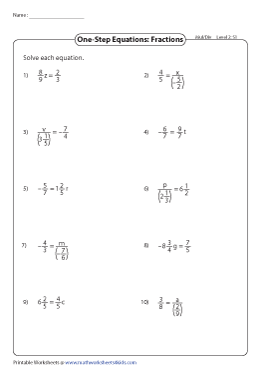 These printable worksheets have proper and improper fractions in their coefficients. 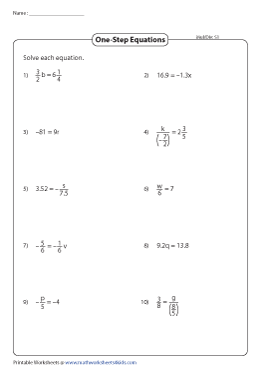 The worksheets can be used for students from 6th grade through 8th grade. 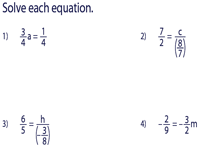 In 'Level 2' fraction worksheets, mixed numbers become the coefficients of the given equations. Perform the multiplication and division operation to solve them. Multiply and divide to solve each one-step equation. The terms used here are combinations of decimals and integers. Download these worksheets to give ample practice to students. 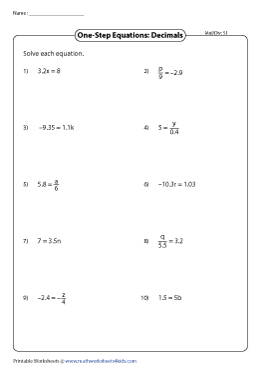 A mix of integers, fractions and decimals are used to form equations in these worksheets. These worksheets are mixed review pages for children. Solve this extensive collection of one-step equation word problems that involves integers, fractions, and decimals. These worksheets are tailor-made for students of grades 6 through 8.